The KL2408 digital output terminal connects the binary control signals from the automation unit on to the actuators at the process level with electrical isolation. It is protected against reverse polarity connection and handles load currents with outputs that are protected against overload and short-circuit. 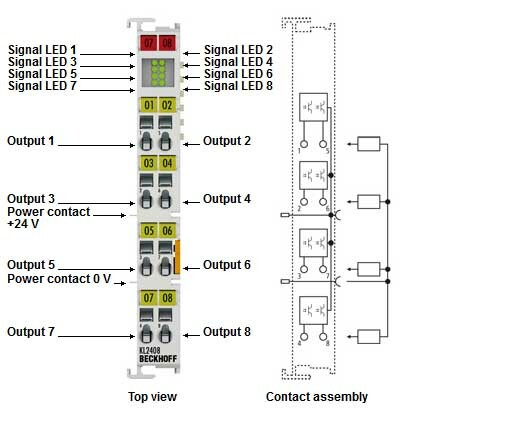 The Bus Terminal contains eight channels which indicate their signal state by means of light emitting diodes. It is particularly suitable for space-saving use in control cabinets. The connection technology is optimised for single-ended inputs. All components have to use the same reference point as the KL2408. The power contacts are looped through. The outputs are supplied by the 24 V power contact.